A continuous exchange from the moment I stepped off the plane and that warm gust of wind hit my face. 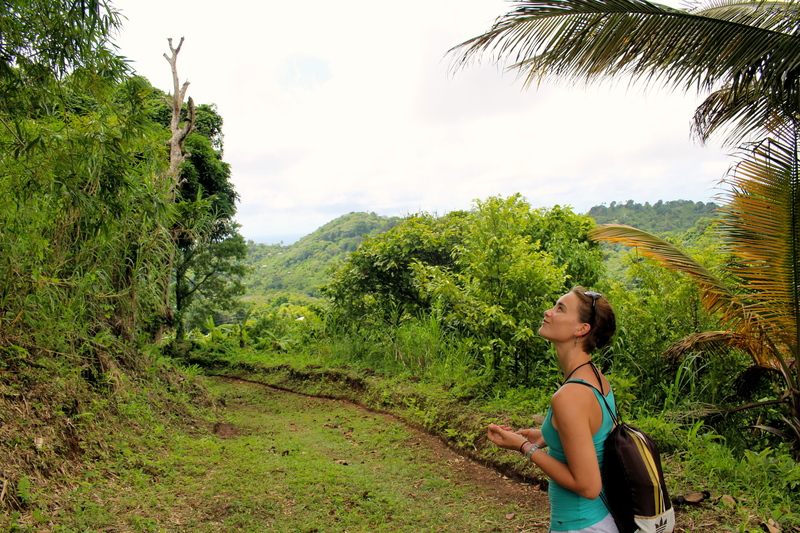 It’s just one of the things that’ll be hard to forget about my residency in Grenada. The whirlwind of events that followed was invigorating, inspiring and at times truly magical without any exaggeration. I can only describe it as though I had been thrown into a blender with Groundation directors, figs from the forest, local visual artists, writers, musicians, fellow creatives, fresh spring water a dash of nutmeg and mixed together into some kind of creative cultural Caribbean smoothie. I was hooked after the first sip. The purpose of the events during ‘Forgetting is Not an Option’ festival Phase N°1 was mostly to encourage and invite creatives of all sorts to submit their work to this multimedia cultural memory project. The project is not necessarily about the Grenada Revolution but more so, addressing the idea of cultural memory and how this relates to our national identity. After avidly researching cultural memory for my Bachelor Thesis, on the subject of souvenirs, I considered it a fitting starting point for my visual arts workshop within this festival. In my artistic practice I am especially interested in how we can feel a certain intimacy with objects that capture emotions or memories. We keep them around us in mementos, photographs or stacks of megabytes. The things we keep or collect tell stories about all of us. 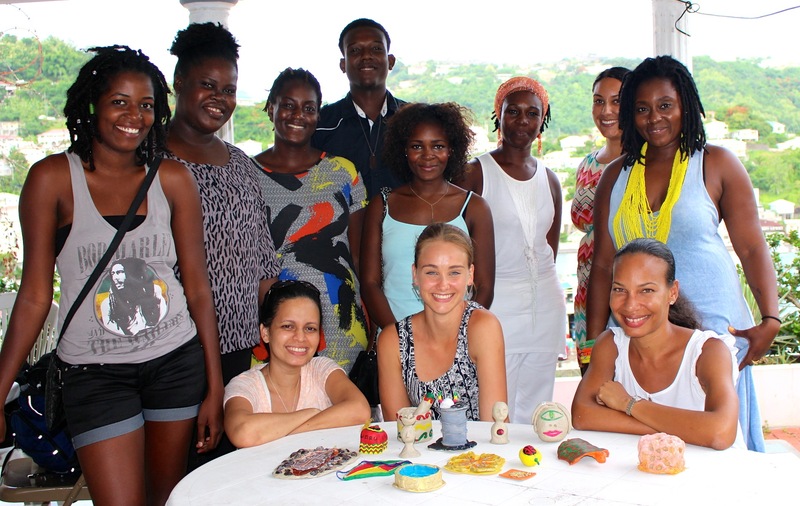 The primary goal of my “Reinventing Mementos” workshop was to invite participants to think of new ways to remember Grenada and transform these ideas into objects. By creating our own souvenirs, the questions of what one should remember and what one should not forget are inevitably embedded. Souvenirs often possess very stereotypical iconography and therefore become icons in and of themselves. The souvenirs sold in the Caribbean are often mass-produced elsewhere and imported to be sold to tourists as mementos of the Caribbean. These mementos are quite disconnected from the source they claim to be representing. 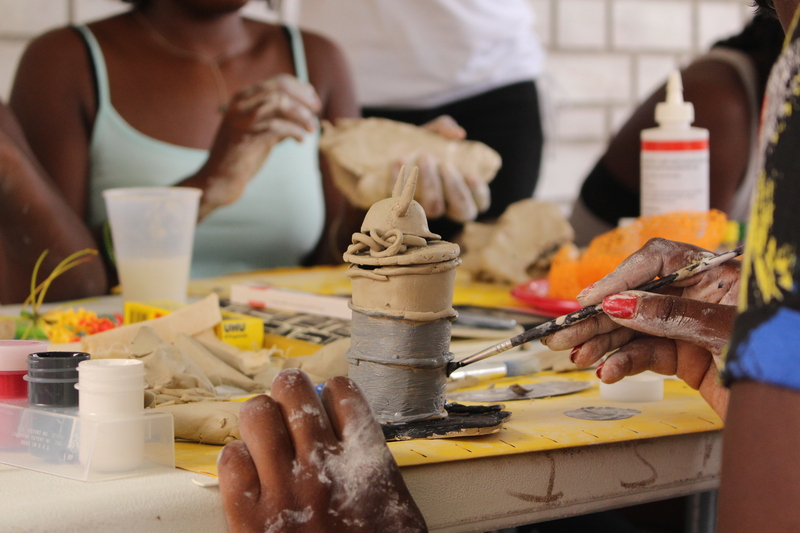 Working with clay, the participants shared the space, learned about each other’s backgrounds, personal interests and challenged stereotypes around souvenirs. We then proceeded to mold these characteristics into our tiny objects. The results were playful, pure, personal and authentic interpretations of a unique island. Next to mingling at the ‘Saracca’ opening night at The Priory, the hike with Mr. Drakes and the smooth vibes during the acoustic jam session, one of my favorite events was the Caribbean film night. It was such a great way to immerse myself into stories and experiences from within the region. The use of a visual language, a specific combination of symbols, rhythm, colors and elements that feels appropriately familiar. Due to the weather we had to take the party inside, which made it feel like a family movie night way back when, sitting on the floor. The rain made the temperature drop just a bit and the atmosphere was humid and perfect for debating about pot hounds, coco tea and barrel culture. After the festival came to an end I managed to sneak in some time to wander around town and take photographs. This led to me stumbling onto a beautiful spot at the Grenada National Museum to install a small intervention in public space. I remember thinking to myself how strange it was, feeling so at home in Grenada from the moment I arrived, as I walked from The Priory to the National Museum. I had to keep reminding myself that I should watch right, left, right before I cross the street here – instead of left, right, left. There were still traces of oily black handprints on the buildings, echoing the jab jab’s that were occupying the streets just a few days before. I crossed the street near one of the only traffic lights in town. Every time I would pass by them, they made me smile because one of the Groundation directors said “traffic lights here are more like suggestions than anything else”. Maybe it’s because I enjoy a suggestion more than a command. The way an artwork could suggest a different angle of looking at the same thing. I suggest we keep suggesting. With much gratitude to Prins Bernhard Fonds for granting me this opportunity by way of financial support and thanking everyone at Groundation Grenada for hosting me as an artist in residence.